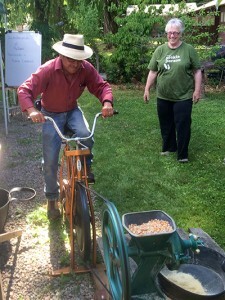 Born in to families of farmers, Charlene Murdock and Richard White have devoted their lives to providing family, friends and community with home-grown vegetables, fruits and, mostly recently, grains. 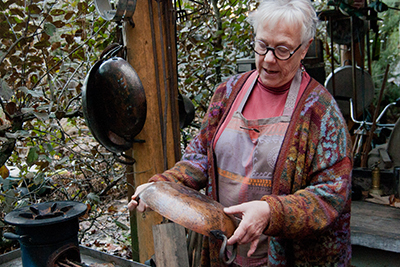 Charlene shares information about a cooper pot, one of the many traditional cooking utensils in the outdoor kitchen. In the 1980s Charlene founded her own specialty food brokerage where she met another aspiring specialty foods broker, Richard White. Together they formed, and for more than 25 years, managed Murdock and White, the Pacific Northwest’s premier specialty food brokerage. Their work brought them in to direct contact with small, artisanal food producers, often as they too were founding and growing their businesses. Many friendships were formed and, as a result, not only food information was shared but “taste memories,” the connection of taste to the food or recipe prepared. 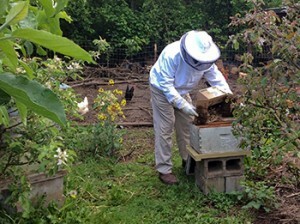 A wide variety of foods grown at the Nana Cardoon farm were often brought to staff trainings and customer meetings, typically as multi-course luncheons to feature the products being presented. Richard checking the soil in one of the many diverse growing areas on the farm. Charlene and Richard were chosen as delegates to Slow Food International’s first Terra Madre gathering held in Turin, Italy in 2004. They were so inspired by who they met and what they saw that they have attended five times over the years, most recently in 2014. 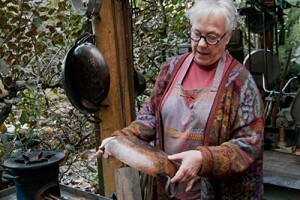 Locally they’re long-time members of Slow Food USA’s -Portland Chapter and are now serving on the Ark of Taste committee. 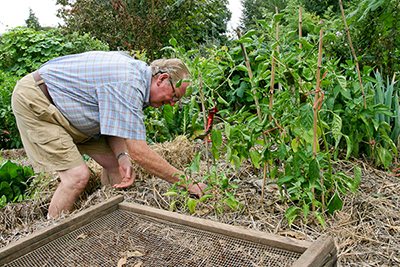 They are active members of Oregon’s Friends of Family Farmers, Forest Grove Grange and founding members of Dairy Creek Community Food Web. Charlene continues as Curator for the Lexicon of Sustainability Pop-Up Shows, setting up educational displays throughout the Portland Metro area including the Ecotrust Building, Montinore Vineyards, the Forest Grove Farmers Market and Forest Grove Public Library. 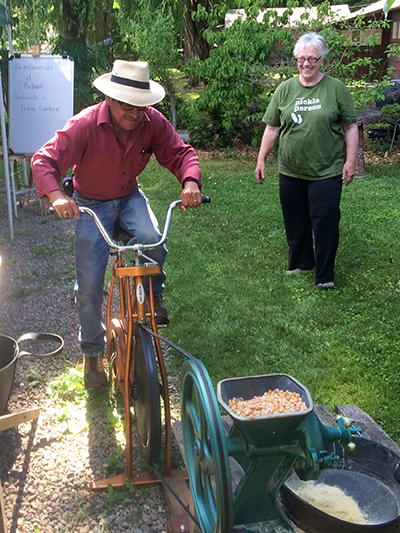 A visitor grinds grain in the bicycle grinding mill as Charlene looks on. Community involvement includes Adelante Mujeres, Forest Grove Community Charter School and Pacific University.